A perfect time to compose a COOP update… I have settled into a comfy sofa, a crackly fire across the room, the wind outside is blowing 50 per, and the snow is blowing horizontally. Yep, it’s Saturday late afternoon on a day the news has already labeled, the Blizzard of 2016. We experienced one of these events every other day last winter. Nothing new to us in New England. Only thing missing in this equation is a glass of Fusion. That’s for later! …where the letters denote pressure, volume,amount (in moles),ideal gas constant, and temperature of the gas (air in the football), respectively. If I may indulge, the commissioner of football obviously inserted his own values into the above law of physics equation. For clarification, a mole = the commissioner of football. For scientific clarity for the above, there will be a demonstration of the Ideal Gas Law, and its absolute influence on balls at next Saturday’s winter social. I may pick a volunteer for this experiment, but please don’t be shy, in my scientific experiment there is very little pressure. Some of you may be thinking that I already had a glass of Fusion. Not so, they don’t all me a visZINary for nothing! I was very calculating to pick the day for our winter social to be this coming Saturday January 30th, the weekend between tomorrows Championship games and the Super Bowl. It will be held from 4-6pm, but come a smidge before to check in and get settled. Hopefully, the winter weather will provide us with an ideal day. That would be a gas! Cajun Bob and his friends have confirmed and will delight us with their musical talents, as usual. And as usual, couples are asked to bring a small appetizer, and in the spirit of consistency, singles can mooch, but they cannot smooch! All receiving this update are welcome, as well as, guests. A fee of $20.00 per person will be charged for entertainment and wine, and $10.00 for non-wine drinkers. 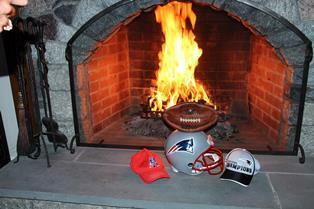 If the Patriots do make it to the Super Bowl, it would be fun to sport your Patriots gear at the social. Hats, jerseys, decals, etc., but please, no muskets or black powder rifles.